Formed in 1974 by students at the Royal Academy of Music under the guidance of renowned quartet leader, Sidney Griller, the Coull Quartet rapidly achieved national recognition, and were appointed Quartet-in-Residence by the University of Warwick in 1977, a post which they still hold today. 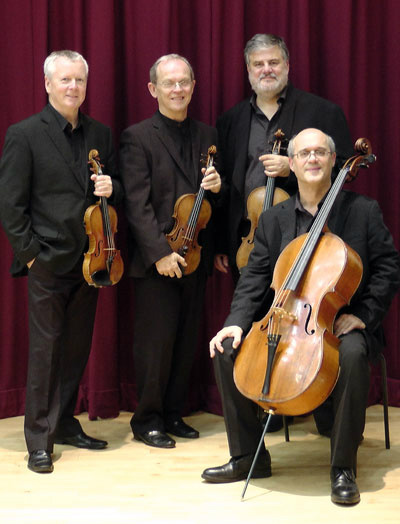 The Quartet has performed and broadcast extensively throughout the UK, and has made tours of Western Europe, the Americas, Australia, China, India and the Far East. Their impressive and unusual list of commissions includes works by Sally Beamish, Edward Cowie, Joe Cutler, David Matthews, Nicholas Maw, and Robert Simpson. These include string quartets, quintets with piano or wind player, works with solo voice or choir, and even a piece for quartet and table tennis players!